I’m a journalist and broadcaster, probably best known for co-presenting Channel 4’s How Clean is your House? from 2003-9. In 2013 and 2014 I presented 50 episodes of Storage Hoarders on ITV. In this series I investigated the increasing demand for storage units and the strain that long-term storage can have on finances and relationships. The programmes have been bought by a number of territories outside the UK including Australia, New Zealand and Scandinavia. I also write a number of regular columns in national publications including My Weekly, Delicious and Sainsbury’s magazine (on food and travel). I am delighted to help judge each year both the Great Taste awards and the Academy of Chocolate awards. 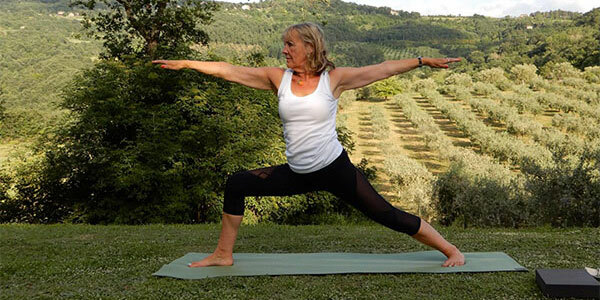 Since I turned 50, in an attempt to delay decrepitude, I’ve taken up yoga, Pilates, running and cycling. I’ve biked across Kenya in aid of Women Against Cancer, London to Paris on behalf of Mind, and London to Brighton for Macmillan. In July 2017 I completed an 18-month training as a yoga teacher. Coming back to your screens soon! Starting Thurs 19 July, ITV1, 9.30-10.30pm. Every Thurs for 4 weeks. I’ve been qualified since July 2017, and teach small groups or one-to-ones, mainly from my home in north London and at workplaces. I teach mainly beginners and level 2, and am experienced at working with mixed-level groups. Aggie helps you to learn how to plan a week’s worth of dishes, from breakfast to lunch to dinner.